Home » Win A Highlander for Christmas! 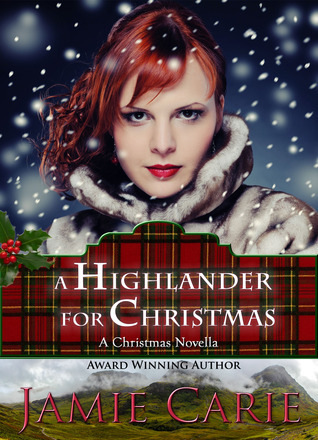 I am having two simultaneous give-aways this week for A Highlander for Christmas. I am giving away two copies here on my blog (paperback or e-book, your choice) and two paperback copies on Goodreads! Just use the Rafflecopter below for the blog copies and the Goodreads link. Would love to win a copy of this book. Thank you for the opportunity. I cannot wait to get my hands on a copy of this book, If julie says its great, its has to be really really good ! I hope to win or at least read it. Scrooge is my favorite Christmas story. My favorite Christmas story right now is Unexpected Christmas Hero by Kathi Macias… Really puts things in perspective. I hope it is not dorky to say the original one. I love reading about Mary, Joseph and the birth of Jesus! I love “The Miracle on 34th Street”. My favorite kid story is “Polar Express”. Scrouge is my favorite !! My favorite Christmas story is the birth of Jesus. Paula, you can’t beat that! Changed everything for eternity for all! God bless! Oh, Rebecca, I love Polar Express too. The visual is stunning and such a great story! No, Not Dorky at all! !The best (that’s such a lame word for it) the true meaning of Christmas. Let us not forget! You’re welcome, Keren. I love giving away my books. Good luck and God bless! You’re welcome, Robbie. Good luck and God bless you this Christmas! Hey Linda! Thanks so much for wanting to read my Christmas story. Julie (Lessman, right?) is such a wonderful person – I just love her and her stories! I hope you like mine as well. Have a great Christmas! Thanks, Virginia! If you don’t win it’s only $2.99 but good luck! Have a wonderful Christmas, girl!! Oh, I love Scrooge too. We just watched the Jim Carrey version the other night. I think I might be related to him based on an interview he did with James Lipcomb of Inside the Actors Studio. He listed some distant relatives from Quebec that we have in common! 🙂 What’s you’re favorite version? I haven’t read that one. Thanks for the tip. I’ll have to pick that up! 🙂 Merry Christmas! You too, Jeanette! I hope yours is filled with JOY, PEACE and LOVE! Hey, Brandy!! When I read about the drummer boy in the American Revolution that helped the men cross the icy Walbash River (George Rogers Clark story that I researched for Wind Dancer, my third book) how the beat of the drum helped to encourage those soldiers through such a difficult march I had a new appreciation for that role. I love that story too. And Jesus’ birth – changed everything this side of heaven. Praise God! It’s a Wonderful Life is so great but I’ve been trying to get my family (all males – three sons and husband – two sons now young adults) to watch it with me. I need some girlfriends to watch it with! Merry Christmas! I love Bachelor Mother and Christmas in Connecticut, of the older movies and the Christmas Card of the newer movies. I love Christmas! Thank you for this great giveaway. Have a Merry Christmas. I don’t have a favorite secular Christmas story. I have always love Tiny Tim in A Christmas Carol but to me THE story of Christmas – the birth of My Saviour – is the most precious. Oh!! While You Were Sleeping is one of my all time favs! I love it at New Years Eve for some reason but that’s one I need to make my family (boys here are 14 and 21) watch with me again. Maybe I can do a trade with some action movie. Know any good ones? LOL! I love white Christmas, bells of st. Mary’s and the homecoming:a Walton’s Christmas. Oh, you are giving me Déjà vu, Virginia! I loved the Waltons! And “bells of St. Mary” is ringing a bell. I’m going to have to look that one up. Merry Christmas to you!! How exciting! I would be thrilled to win!! My Mom says that I say many movies are my favorite…haha..Actually though I do have some definites. 1#:Christmas In Connecticut, 2#:The Muppet Christmas Carol(and most other versions that I’ve seen, espc, the 1950 one and the George C. Scott one) 3# It may sound a bit crazy but, here it goes: Ernest Saves Christmas 4#: White Christmas 5#: While You Were Sleeping And, special notice to the original Miracle on 34th Street…totally won me over 😉 Thank you! I hope that you have a truly blessed holiday season. Merry Christmas!!! Julianna! (What a great name, BTW! I named my most recent character Juliet from A Highlander in Christmas and I love all the forms of Julia! When I was a girl I always pretended to be “Julie London” – hmmm, pretty good writer name, maybe I should change it! Ha!). Anyhow… I haven’t seen Christmas in Connecticut, so I’ll have to check that out. We love the muppets! I used to own some puppets that were very similar and did a puppet show with some girls at church for the kids. I hope your Christmas is truly blessed this year! Thanks for stopping by my blog and good luck in the contest!! Merry Christmas and God bless!